Water is great at making headlines. We’re constantly being told to drink more water. But how much is enough as far as our health is concerned? 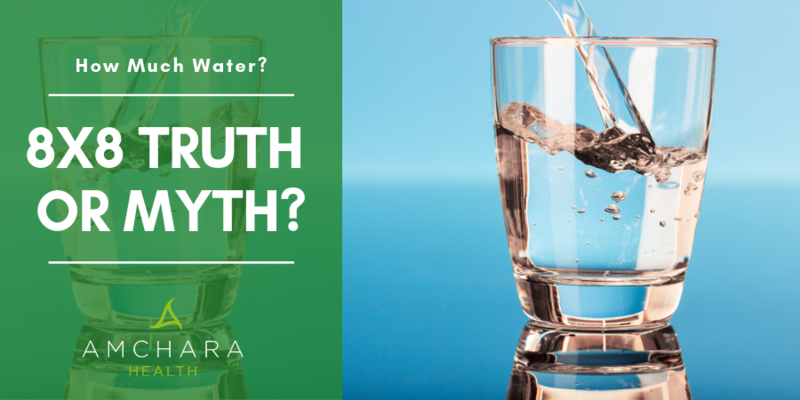 In this article we’ll untangle the myths from the reality to find out how much water you need for optimum health. Why do we Feel Thirsty? How Much Water is Optimal for my Health? The health of our body depends on having the correct water balance. This is because we are made up of 60% water. 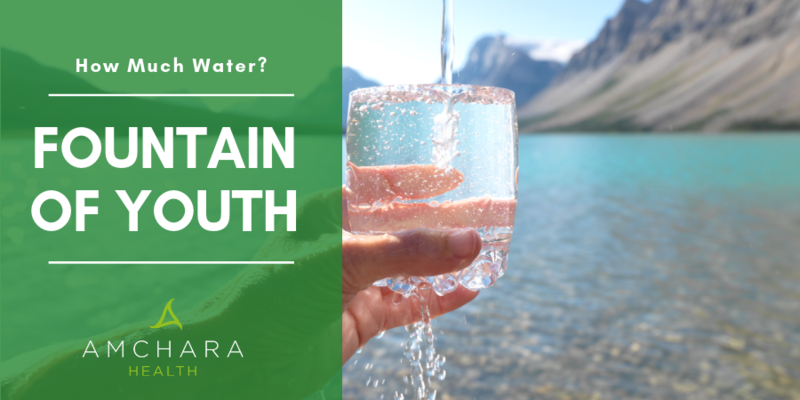 Water is vital for body functions from the maintenance of body temperature, to transport of essential substances like hormones and nutrients, to the lubrication of joints and cells. We can only survive a matter of days without water. Because we are constantly excreting it in our breath, sweat and urine, the body constantly needs to replenish fluid. 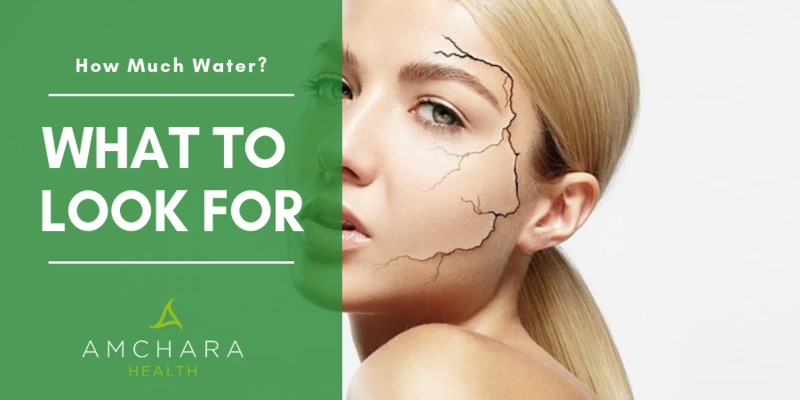 How long we can survive without water depends on our activity levels, the outside temperature, what type of food we are eating and even our age. One study (8) concluded, by looking at news stories of people trapped without water, that the longest time anyone could survive without drinking is 21 days. Scientists tend to measure it in terms of percentage of body water lost. 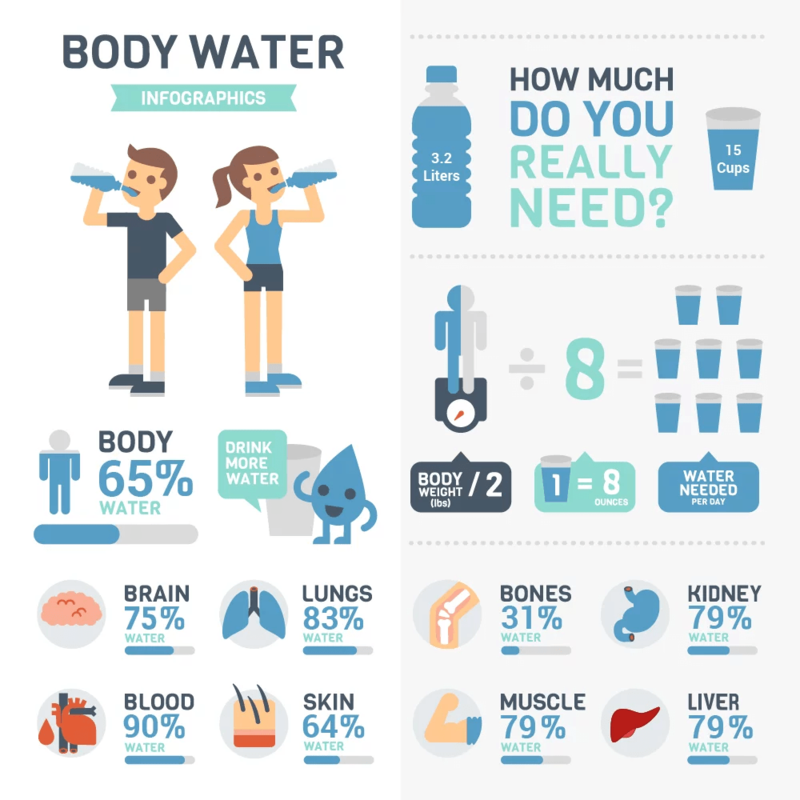 A water loss of up to 6% is considered mild dehydration, while severe dehydration is defined as a loss of between 10 and 15% of the body’s water. Even mild dehydration can cause unpleasant symptoms like fatigue, headaches, constipation and even dizziness. It can also result in dry skin, light-headedness, irritability, confusion, low blood pressure and elevated heart rate. According to the Mayo Clinic, you’re already dehydrated by the time you start to feel thirsty, as feelings of thirst don’t kick in until you’ve lost between 1 and 2% of your body’s water. At this level of dehydration, you could already be experiencing forgetfulness or agitation. A good guide to whether you are adequately hydrated is the colour of your urine, which should be a light straw colour. If it’s a darker yellow or even brown, it’s time to drink some water. When we are thirsty, we drink. But have you ever wondered what it is that makes you thirsty? The body maintains a state of water balance by clever regulatory mechanisms involving the brain and the rest of the body. Cells in the hypothalamus of the brain receive information about our blood volume and the concentration of sodium in the body’s cells. If we don’t have sufficient water, the sodium concentration will be increased. At the same time, our blood volume will fall and our body cells will shrink and become less plump. A fall in blood volume or an increase in sodium concentration stimulates the release of a hormone called vasopressin, otherwise known as antidiuretic hormone (ADH). This hormone is made by the hypothalamus and tells your kidneys to retain more water. A decrease in the amount of water excreted in the urine will conserve body fluids. While all this is happening we will experience the familiar symptoms of thirst – particularly a dry mouth. When we drink enough water, the osmotic balance of the cells will be restored and blood volume rises again, so the thirst impulse subsides. Elderly people may find they no longer feel thirsty when they should, as they become less sensitive to the thirst stimulus. Researchers found (7) subjects over 68 years old did not feel as thirsty when dehydrated as people in their twenties did. This can mean the elderly may easily get dehydrated without realising. For something that is crucial to our health, there is relatively little research on health benefits of water, maybe because it can’t be patented. One study looked at water intake in over 20,000 people belonging to the Seventh Day Adventist movement. The results showed men drinking more than 1.2 litres water per day had over 50% less risk of fatal heart disease over 6 years than those drinking less than half a litre per day. Although the results appear remarkable, the group as a whole are less at risk for heart disease as they don’t smoke or drink alcohol, and it’s hard to unravel cause and effect. Do people get ill because they are not drinking enough, or do they not drink enough because they are ill? If we don’t drink enough, it’s not surprising the brain can be affected, as it’s made up of about 73% water. Two studies have shown that when both healthy and obese subjects drank 500 ml water, the metabolic rate of their body cells was increased. Their cells burned off energy an impressive 30% faster for healthy weight subjects and 24% for obese subjects for one hour after the water was drunk. A smaller increase in metabolic rate was seen with 50ml water. The effects were detected as little as ten minutes after the water was drunk. The authors of this study calculated that only a third of this increased metabolic rate was the result of warming the water from its starting temperature to body temperature. Extrapolating to someone drinking 2 litres per day, an extra 96 calories would be burned as a direct result. It would make sense that the colder the water is, the more calories your body will use to bring it to body temperature. Interestingly, in the normal-weight male subjects, fat was used as energy to fuel the increase in metabolism, whereas in women it was carbohydrates. Studies have also shown (10) that 500ml water drunk half an hour before a meal reduced the amount of calories eaten by 13%. This seems to be particularly the case for older adults. Drinking enough water would therefore appear to be sensible for people trying to lose weight. Many people avoid drinking water because they suffer from water retention. Water retention causes bloating and puffiness especially in the ankles, abdomen and arms. It’s uncomfortable and can cause weight fluctuations of a couple of pounds a day. However, the body won’t hold on to water just because you’re drinking it – water retention is caused by other factors such as hormone imbalance. It can also be caused by too much salt in the diet, particularly when combined with low potassium, which is found in fruit and vegetables. The kidneys balance our body’s water by pulling it out of the blood by osmosis, which relies on the correct balance between sodium and potassium. Salt will encourage the kidneys to hold on to the body’s water. Unfortunately the modern diet which is high in sodium and low in potassium tends us towards water retention. Drinking more fluids can actually reduce water retention because it allows the excess sodium to be flushed out of the body. When we are under stress, we release a hormone called cortisol. One of its effects of cortisol is to increase fluid retention ,(11) as well as increasing vasopressin and causing us to become thirsty. If we don’t get enough sleep, our body will tend to hold onto water, because if we’re not sleeping properly our cortisol will rise. Sleep also appears to regulate sodium and water balance via the kidneys. Weather – in hot weather, we sweat, and we’ll lose water through our sweat glands, as sweat is predominantly water. Although in high temperatures we can sweat a staggering 1.4 litres per hour, it may not always be obvious when we are sweating, particularly in a warm dry climate when the sweat evaporates before we’re aware of it. Activity levels – sweat is lost during exercise. Certain drugs can lead to water loss, such as those for high blood pressure or laxatives. Diet – a high salt intake increases our need for water. We all know salted peanuts and crisps make us thirsty. Certain foods are high in natural water such as melon and cucumber, so if these form a large part of our diet we won’t need to drink as much. Diarrhoea or vomiting mean we lose water. Excess alcohol intake – alcohol causes us to urinate more. For every 1g of alcohol drunk, urine increases by 10ml. A standard drink contains about 10g alcohol, so for each drink, you’ll pass 100ml extra urine. Alcohol reduces the secretion of vasopressin, so the kidneys don’t reabsorb water. Diabetes Insipidus. This occurs when the body is unable to conserve fluids by alteration of kidney function. People affected produce large quantities of dilute urine, so need to increase their intake. Electrolytes are minerals such as sodium, potassium, calcium and magnesium. They are present in your blood, urine and tissues and they help the body’s water balance. An imbalance in these electrolytes is largely the reason we feel the effects of dehydration all over the body. If you become dehydrated because of excessive sweating, vomiting or diarrhoea, rather than simply drinking too little water, it’s likely that your electrolyte balance will be depleted. In these situations your GP will often recommend an electrolyte-replenishing drink. Coconut water has a high electrolyte content, and is particularly rich in potassium, which is why Dr Axe recommends it for hydration, particularly after exercise or illness. Traditional wisdom has been to recommend 8 x 8oz glasses of water per day, which amounts to just under two litres. However, one review of research in 2002 review suggested there’s no scientific basis for this. It’s often also said that caffeinated drinks rob the body of water, so they don’t count towards the 2-litre total. However, recent studies suggest caffeine is not as strongly diuretic as previously believed. In one study, researchers found people who usually drank between 3 and 6 cups of coffee per day did not produce more urine when given a dose of caffeine compared to water, and their total body fluid level was unchanged. Researchers did note, however, that more sodium was lost in the urine of the coffee drinkers than those who drank only water. It’s worth remembering, too, that caffeine can irritate the bladder so it can makes us want to pass water more often. Too much water is bad news, too. On occasion, people who have exercised intensely, and users of drugs such as ecstasy have literally drowned themselves by drinking excessive amounts of water in a short space of time. If that happens the kidneys can’t flush it out quickly enough, which causes the level of sodium in the blood to drop too low. The liquid moves from your blood to your cells, causing them to swell. This is termed water intoxication – but it is relatively rare, and only occurs after drinking literally gallons of water very quickly. New research suggests that when we’ve drunk enough water, our swallowing reflex is inhibited by the brain, which makes us less likely to carry on drinking once we’ve had enough. Taking all the above into account, although water is crucial for good health, there’s no hard and fast rule which determines how much to drink each day. Our requirements will differ from day to day and person to person. The best advice is to listen to your body and never ignore your thirst signal. Sip filtered water little and often through the day (in a BPA free bottle) and be guided by the colour of your urine. If you don’t like the taste of plain water, jazz it up with a squeeze of lemon, some grated ginger or some sliced fruit – try these recipes from Cooking Light. Treat yourself to coconut water for a refreshing change. Remember herbal teas count towards your intake. Include water-rich foods in your diet such as watermelon, strawberries, peaches, cucumber, lettuce, celery, courgette and soups. Interested in a Change for Good? Why not enquire about a personalised health consultation with Amchara. Can Water Fasting Improve Your Health?